float-on & Float-off of specialized, large, technically challenging marine structures in Technically challenging environments. 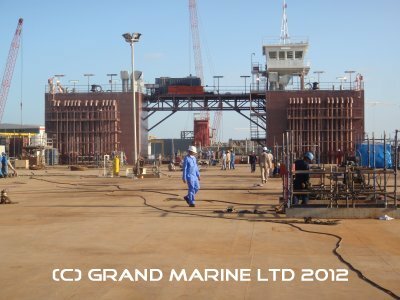 Working with many Marine Warranty Surveyors from many countries over many years, Grand Marine has created an effective Method Statement "procedure manual" incorporating the latest Project Management, Operational, HSE, JSA, FMEA procedures in an easy to reference document for your project. Whether Load-out/in, Transport, or Float-off/on we can easily tailor the engineering into a specially designed Method Statement that marine warranty surveyors demand today. A bottom reaction submersible barge allows the client to load a structure with dimensions that exceed the barge itself. 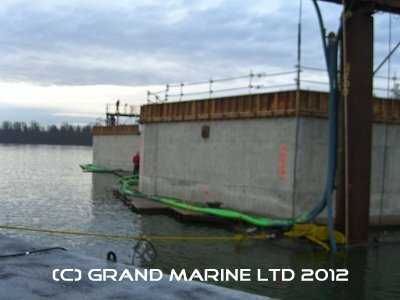 Detailed stability, structural, and ballasting calculations are used allowing the barge to be ballasted to a predetermined depth using the barge transom grounded on the seabed to allow a calculated timely float-on or float-off in a given marine environment. Pre-existing ballastable barges are common and can be modeled to suite a specific requirement. 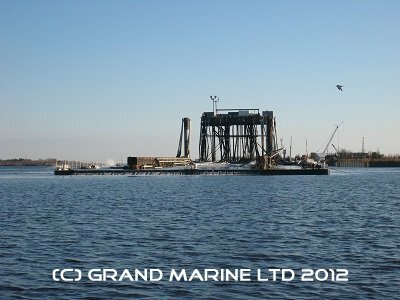 Barge conversions to "temporary" semi-submersible are commonly engineered on an "as required" basis. Specifically of benefit to the Oil & Gas industry, Jack-up, Semi-submersible, Jack-up ships, Matted rigs, etc. Often used in the constructing and launching of bridge tower base, "template" structures. Docking plans, and damage condition docking plans accounting for localized stresses have been engineered. Engineered docking plans allow for placement of point load structures minimizing the local stress imposed on the dock and ship.